The Didcot Chess Club are recruiting new members. 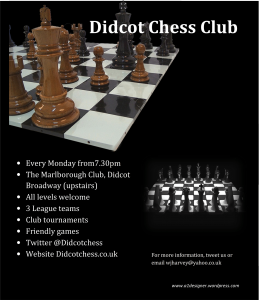 They meet at the Marlborough Club (upstairs) in Didcot from 19:30 on Monday evenings. Operating a 3 league team along with running various tournaments and friendly games. « A new WI is coming to Great Western Park!